God is doing something big in me. Through me. To me. At me. However you want to put it. Big. And then some. There is a Sovereign earthquake rustling going on in my heart and in my soul. And Satan is pissed off. And then God dropped the bomb on me in the form of a book. God’s bombs are good bombs. Not always my favorite, but always good. So, my dear partner in writing crime, let’s call her Thing One, (because yes, I am Thing Two. She’s first cause she’s, like, waaaay older. Hehehe. Can’t wait ‘til she reads that!) She fairly casually recommended for me to read this Interrupted book. Knowing I am such an avid reader somebody just spewed coffee from their mouth, she let me borrow hers. Then she went out of town for two weeks. God had Sovereignly brought the 2×4 to end all 2×4’s upside my head. And she was in flippin’ Ohio. Now I know my geography is atrocious but I’m fairly certain that is way far north. And maybe west? So, all Thing One and I could do was text each other. So, txt we did. Understatement of the century. I would send her a quote from the book that the Holy Spirit used to cut me to my core. She would send me a quote so funny, I darn near had tears running down my legs. Back and forth, me sending funny quotes, then her sending heart conviction quotes, me sending thisauthorknowsmysecretthoughts quotes and her sending don’thavefoodinyourmouthwhenyoureadthis quotes. It was quite an interesting couple weeks of txting. But, we couldn’t wait to actually get together, face to face and TALK about all God is saying/doing/leading/prompting/hittingusovertheheadconvicting/humbling/calling us to do. Did I mention this kind of thing pisses Satan off? The thought of two people with a call from God to write a bunch of words that bring Jesus honor, and who are actually desperately trying to pursue a true live-like-Jesus-did-dangit type of mission…makes Satan furious. And boy did he show it. We planned a meetingbeforethemeeting so we could get all the initial stuff thrown up out of our mouths. 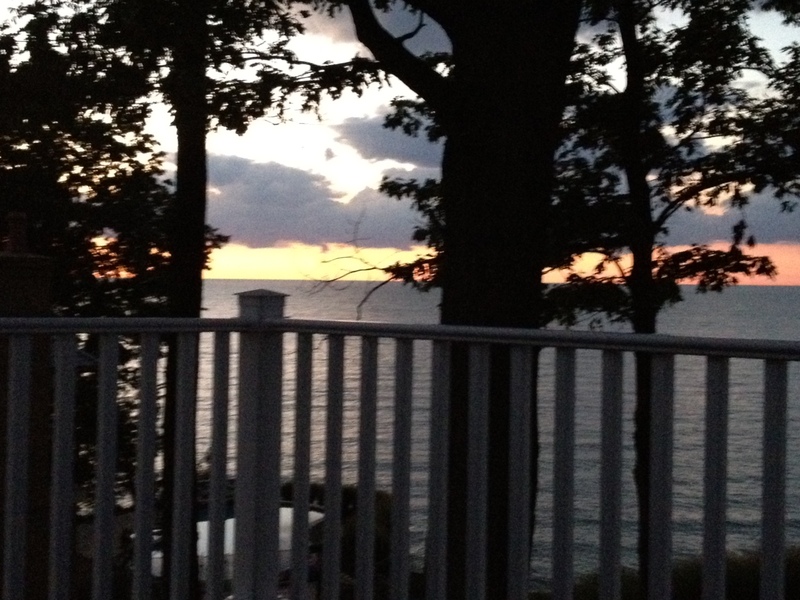 Then, we would have our FPT (Front Porch Time with her beloved rocking chairs) and then, once we’d gotten all our first few annoying and jumbled and rambling and baffled rounds out, we would invite our men to a meeting of the four of us. Schedule was set. Confirmation was complete. It was done. My sweet Jacob got sick. Like, bad sick. Who gets sick in the summer in Texas? My kid does, that’s who. High fever out of nowhere. Not acting like himself. Sluggish. Weird croupy cough. In stinkin’ August, people. Not fun! But, it’s early. We still have a couple days, Jacob could bounce back. In the wee hours of the night, some eight years ago, I will never forget the very millisecond Jacob breathed his first breath. I was forever changed. It was true. Jacob was hardly gettig any air in. Old enough to be fully aware that this was serious, he was doing all he could. But, he just.couldn’t.breathe. After trying an initial breathing treatment, he still seemed about ready to pass out and unable to get good air in. (Confirmation this night: I do not belong in emergency situation) This is when my husband who never freaks out about anything, ever – we make a lovely pair, don’t we? – looked at me with a smidge of freak out in his eyes. This ‘bout sent me over the edge. Riding in the ambulance with your child is unlike anything I’ve ever done. It is surreal. It is unnatural. It is scary. To God’s glory, the amazing doctors and nursing staff at Cooks Children’s Hospital were able to open his airway and steady his breathing. After three hours of treatments and tests, they released us to come home. No pneumonia. No bronchitis. Only croup. Very scary, but manageable. We all got home, and rested most of the day. i.e. Mama passed out in bed and wasn’t aware of what any of her other offspring were doing, only the one whose chest lay under her hand as they slept. Because our meetingbeforethemeeting was technically at a kid function we both planned to attend and then subsequently isolate ourselves from the other Moms so we could talk about this big God thing – I couldn’t very well show up without my kid. “Don’t mind me, I’m just here to chat with her.” Nice. Our first meetingbeforethemeeting now cancelled. FPT is all we had. But, first, it’s church day. We attend Saturday night service for many reasons. It began as a way for my lying-flat-all-day-long self to be able to attend church at all. The service was less crowded, so I could bring a pillow and take up four chairs without looking too much like a selfish lazy bumb. Then, it became a habit. (The Saturday night part, not the pillow-bringing, lazy bumb-looking part, praise God!) It also became a catalyst in our family’s enjoyment of our sacred Sundays. No plans. No ‘outsiders’. No errands. Just us. Team Holzberger sabbathing together. But, tonight, our whole team couldn’t go. Daddy would (ahem.) sacrifice and stay home with sweet recovering Jacob and I would take the other two rascals to church. Lord knows we all needed it. Rain? Ha! That won’t keep us away from church! Although, for the record, the pounding thunder sounds fairly intense coming through the roof of a huge concrete and steel building. Surely it’s not really that bad outside. I repeatedly thought allthewhile fully paying attention to the sermon. Surely it’s not really that bad outside. For those of you who don’t live in Texas, I am so sorry! we are an ‘anything worth doin’ is worth overdoin’ kind of state. I fit in quite nicely. You know what they say about everything being bigger here? That includes rainstorms. In the region of this fine state where I live, we generally get two types of rainstorms; light-and-annoying-but-just-enough-to-mess-up-your-fresh-car-wash-but-ain’t-gonna-do-a-dang-thing-for-your-dried-burnt-grass kind of storms, and then there’s the somebody-go-find-any-guy-named-Noah-cause-I-think-God-changed-His-mind-and-is-wiping-us-all-out-again kind of storms. 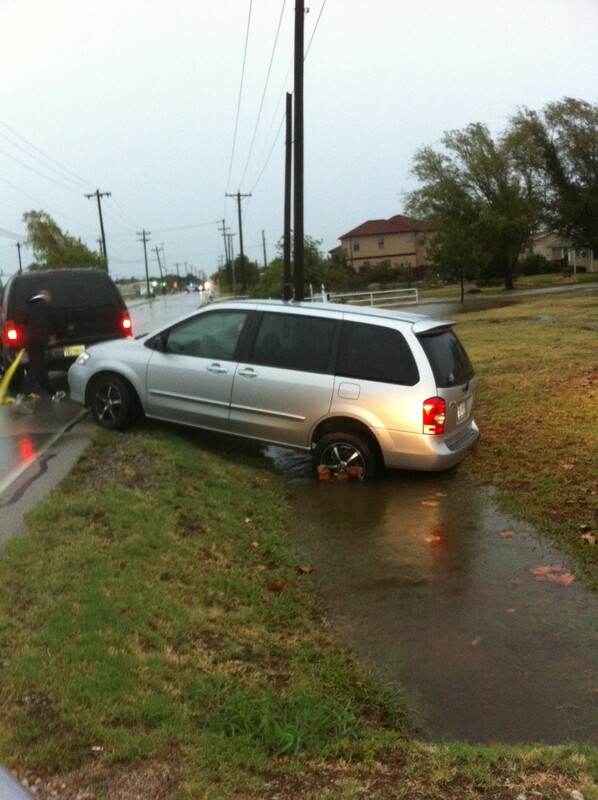 Somehow the three kids and I got to my blessed Grace (the van) without being washed away. Did I mention Ryan was home? As in, inside and dry? Like, not at church this time? During the flood? Ok…just checking. So, me and my two younger chicks get safely inside Grace, wring out our clothes, and laugh about how we…um, er, gracefully ran there all huddled up together. It was quite a sight to see. T-minus two hours until FPT. Ok, Drive home. Get kids fed something that resembles nutrition. Oh yeah! We got drenched in the rain…bath time = check. Cuggle. Sing songs. Say prayers. Tell them they ‘must go to sleep or else’ about six times. Then drive to Thing One’s house and finally talk about this God stuff. I can do this. I can do this. I can do hard things!! Then I see what looks like two cars who’ve gone off into the ditch. Oh no! Poor things! Then I see white lights. Blurred lights through all the rain. But, I’m certain they are white. Wait a minute, don’t the white lights on the back of a car mean reverse!?! Shootamonkey! Those people are driving backwards. My brilliantandnotatallstuntedbybirthingandraisingthreechildren brain deduced that the road is so flooded up ahead that people are turning back…as in, backwards to avoid being ditch-dwellers like the other cars. So, in my true nature of following everyone else’s lead (ahem.) I assure myself I can do this better. She said humbly. Oh this is good! I should have gone the main roads anyway. In fact, I can do one better. I don’t want to just drive backwards. Instead, I’ll back up into one of these driveways that I can barely see off the side of the road and then turn around and drive safely going forwards in the other direction. Brilliant plan, self. Why, thank you, self. May I introduce you to ditch-dweller #3? Me. I would love to say the rapids swept me up into the ditch. And I very well may change my story to that someday, be prepared. But, really, I just made a false move, couldn’t see a bloomin’ thing, and slid in the mud perhaps? down into the ditch. This would be an appropriate time to interlude a story of my incredible backwards driving history. Me and Tow-Mater are ranked nationally. I may or may not have bragged on num-er-ous occasions to my husband that I can back out of anywhere. I drove camp vans for goodness sakes. Crap! Ryan’s gonna kill me then tease me forever. This cannot cost us more money on top of Jacob’s ambulance ride and ER visit from THIS MORNING! Ugggghhhhh. Holy cow! How will we get out of here. Ryan can’t pack sick Jacob up and come get us. Oh no!! Ok, STOP! Assess the situation. A – open the airway. B – check for breathing. No wait…that’s not right. Nice. Thanks, only daughter of mine. As if someone was trying to help me pick up dropped groceries. Or tie my freaking shoe. No, no…says the-woman-in-a-ditch-with-her-two-small-children-in-the-middle-of-a-flood….I’m good. I got this. Oh pride, be gone. So, in true me fashion (Ahem. Ahem. Aheeeemmm.) I submitted to his advice and took the help. This well dressed and handsome Knight-in-shining-prep-clothes rushed to my door with his umbrella. He calmly reassured my kids that everything was going to be ok. Abigail is screaming now cause “I DOOON’T WAAAANNNAA LEEEAVE MY VAAAAN, MAAAMMMAA!” Thanks, Abigail. You’re right. Let’s just hang out here in the van for a while. Wanna play Angry Birds on my phone? Sigh. I scooped her up, trudged through the pouring rain while the Knight grabbed Benjamin and put our soaked, muddy, hysterical selves into their luxury SUV. Leather. Little TVs. Screen in the front for the GPS thingy. Grown-up wood paneling. I am fairly certain there was a mini-fridge somewhere. I immediately wanted to scream to my children, “If you put your muddy shoes all over these beautiful seats, sohelpme, I will send you back into the pouring rain!” Thankfully, for once, I refrained. Me, frazzled? I know, shocker, huh? I am a spazz when I am rested, prepared, ironed and freshly highlighted. So, God bless the poor unsuspecting people who pulled me outta a ditch. They did NOT know what they were getting themselves into. Fo’ sho’. You know how you picture what it would be like to meet a famous person and you, unlike all the other losers, would completely hold it together and not slobber all over them and throw yourselves at their feet in a mess of snotty tears? You are bigger than that. But, then you see Jordan Knight and Joey McIntyre (from NKOTB, like duh) at a table having lunch and you shriek so only dogs can hear, trip over your oversized jellies and MC Hammer pant’s cuffs, flinging a plate of spaghetti into Jordan’s face and landing your face dead square into Joey’s crotch. Ya, it was pretty much like that. Only worse. No, these people weren’t famous. But, oh what a fool I was. I was nervous. Embarrassed. Frazzled. Confused. Scared. Sostinkingmadatmyself. Oh ya, and I looked like a wet poodle. Ps. I went suuuuper casual to church that night so I was wearing black yoga pants, a t-shirt, and sketchers. I talked too much. Overcompensated even more. And basically blabbered all over these poor unsuspecting people who had just rescued me and my babies. I may or may not have also mentioned my extreme labor with Abigail, being named after a country song, and my husband’s recent vasectomy. For the love of Pete, we were only about five miles from my house. Those poor people. God, could you please bless my dear rescuers for A: picking us up, and more importantly for B: not throwing me back out after mile two. I hugged her neck (way longer than you should with a stranger) and whispered (not in a creepy way, but in a sincere way…I think.) “Thank you so much for helping me and my kids. It has been such a tough week. I honestly don’t know how to thank you.” I think she saw it in my eyes. Behind the fear, the frazzlement and the obvious insanity – I tell myself that she saw the glimpse of Mama desperation and gratitude I was trying so hard to display. Then I cried and hugged her Knight and thanked him again and again. I was quite certain they couldn’t back out of my driveway fast enough. They avoided the ditch on either side of my driveway just fine, for the record. I watched them drive away and made the kids wave and wave. Ok well, I hope I don’t bump into them in the Target line. Her kids may start sucking their thumb and rocking back and forth while pointing at me. My Knight rushed out with my sweet Dad and off they went into the rain to rescue our Grace. With them, our dear friend who is a wicked strong guy with an ever bigger heart. These three men braved the elements, arrived at the ditch, on a mission to save my sweet van. It took them about three minutes. Dangit. the raging rapids being a lot deeper than that. Ryan and Dad and sweet James all got to their respective houses safely. My repetitive thought – But what about FPT time? God, I know you wanted us to do this. I txted Thing One to see what she thought. We went back and forth about what kind of crazy person rushes with her kid to the ER in an ambulance, then drives her van into a ditch and still gets back out into the rain. Knowing Ryan would deny my request to take our only other vehicle out in this weather, I only asked because I told Thing One I still wanted to come. She and I are selfish and a little nuts right now, with this intense desire to know what God is trying to do in us, through us, at us, etc. She asked her man. I asked mine. With all due respect to her man, who was technically probably wiser at the moment…we picked Ryan’s answer. He knew how long we’d talked about this. He knew how desperately we needed to get phase one of this out of our mouths. He knew God was working. And Satan was working too. I drove to her house, only thirty minutes later than we had planned, days and days ago. Before the ambulance. Before the ER. Before the flood. Before the ditch. As I drove to Thing One’s house in what had now become the other type of Texas wimpy drizzly rainstorm…I could help but smile. God totally won. I have no idea what He is going to do with me. I’m fairly certain He feels the same way always sometimes. It was precious. It was all about Jesus. To Him be the glory. As far as what we discussed…you will have to wait ‘til tomorrow. But, know this friend…when you are trying to do good for God – Satan will come. He fights mean. He fights dirty. He fights hard. You will lose if you fight back on your own. Guaranteed. May I humbly encourage you to do the thing God’s called you to do. Don’t shrink back in fear. Don’t get caught up in the complacent, self-serving, too-busy-with-soccer-and-and-school-and-work-and-errands-to-do-good-for-God cycle. I know that cycle well. It is a cycle that brings Satan pleasure. Flee from it with me. Get back out in the rain and drive. And tell Satan to GO TO HELL! (Please not in front of my rescuers children.) It is where he belongs and will be for all eternity. Amen. Ps. Praise God from whom all blessings flow that the NKOTB story was purely hypothetical, yet completely possible in my world. Just cried tears down my legs laughing at you, THEN tears from eyes, I miss you so much. I read that book! And I read Shane Claiborne’s Irresistable Revolution too. I’m about ready to join a commune. Those books are wreaking my life in the best way. I’m glad you’re all ok!